Design your software, website, or mobile application mockups within minutes using the ProtoShare Stencils and Widgets Library. Create mockups quickly and easily with the drag and drop Library that includes extensive component sets for Twitter bootstrap, iOS, Android, basic objects, Web & Desktop, and much more. You can even create your own interactive mockups from design comps using ProtoShare states. The easy-to-use mockup tool from ProtoShare also keeps all team members connected in a collaborative environment. Don't try to force creativity into a rigid, linear project management process - it won't work. Enhance your team's natural creative process by allowing them to rapidly develop mockups and then let ProtoShare track feedback and decisions for you. No more wasting time and energy using multiple programs when ProtoShare does everything that you need it to. Why use ProtoShare for your Mockups? That's simple. 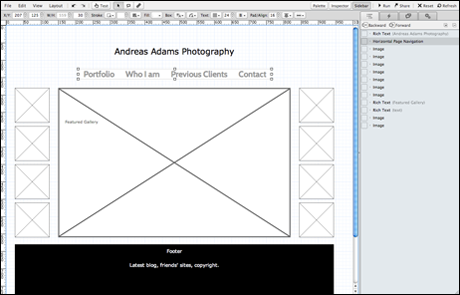 Once you have created a mockup, you can easily transition it to a wireframe or prototype. You don't have to transfer your original ideas from another product used to create the mockup and you have everything in one place. Many companies begin their project with a discovery phase. They assess ideas and outline potential layouts with static mockups created using design software, and then review with clients using a remote meeting and desktop sharing software. Why is this so inefficient? Not only is the company wasting time on something that lacks interactivity, they are also having to communicate back and forth with the client on the mockups by taking notes, making phone calls, and e-mailing about feedback - all things that have the potential of getting lost. With ProtoShare, communication is kept in one place, where it can be referenced and reviewed at any time. Once a client or stakeholder understands what you are going to build for them and they can visualize the functional prototype with interactions such as drop down menus, rollover states, carousels, and more; you are able to avoid project scope creep and save an enormous amount of time, money and headaches.